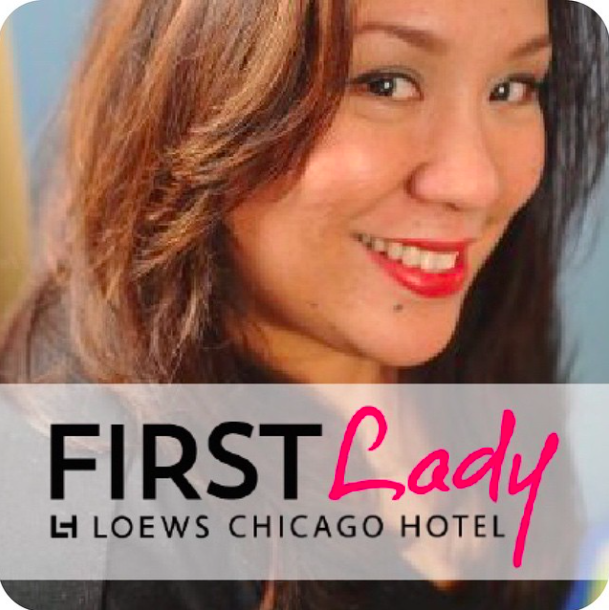 SugarMyBowl.com: Barbara Millicent Roberts is still on the go! Barbara Millicent Roberts is still on the go! My love for Barbara Millicent Roberts started in the 70s. A love affair that started from the 1960s Barbie books borrowed from our school library and with my wild imagination that came with reading them. I still remember it well. I read and reread those same books that you can see my daughter is holding on that picture above. I daydreamed about the blushing Barbie on dates with the handsome Ken, and the first Roberts family luau that I obsessively read in the Hawaiian Holiday book. It was all too exciting. It wasn't until I was in 6th grade (and probably too old to be playing with dolls then) until I had my first set of Barbie dolls. They were hand-me-downs from a cousin. 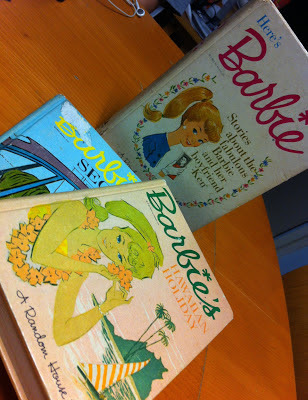 But my true earliest memories of Barbie were in a book form. 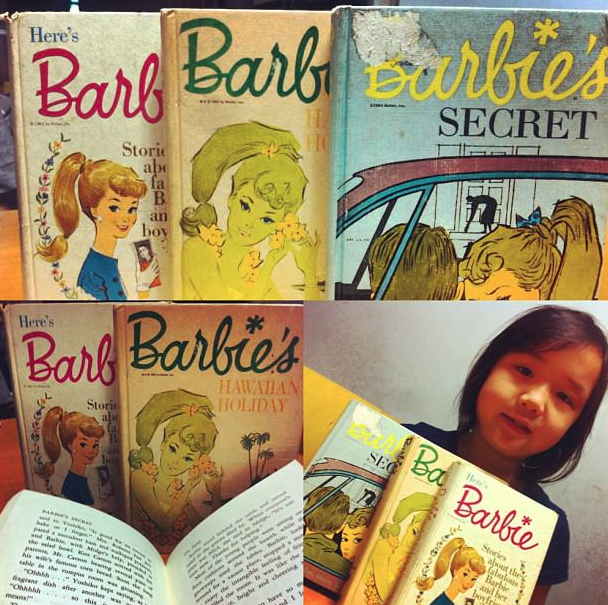 I learned to love and treasure those dolls because of the Barbie books I've read. So when we had our baby girl in 2007, my husband surprised me with these Ebay purchases of the exact 60s Random House now vintage Barbie books. I've told him many times on my wish to have my daughter read the same books I've enjoyed as a little girl. So he knew exactly what perfect gifts they were for me and the little one. He happens to be the perfect husband too - ok not perfect, but pretty darn awesome, don't you agree? We haven't read the book together yet, but we will get to them very soon. She recently just started playing with her American Girl dolls more. She now enjoys brushing their hair, changing their clothes, and I can already see that she had the same kind of playful imagination like I had as a little girl. I see it in her eyes. I seriously cannot wait for her to play with her Barbie as we read the books together. 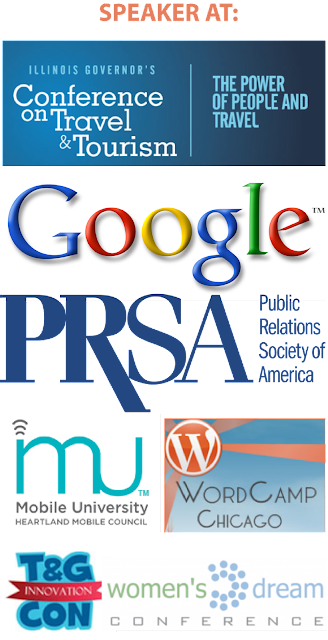 Just so perfectly that I was approached by One To One Network if I'd like to jump on board with the #BarbieIsMoving program and of course I did! Barbie is moving out of Malibu and touring around to party with her fans just before she hits here final destination! This event is free and there are lots of activities for the kids. Won't you come and join me with your little girls? 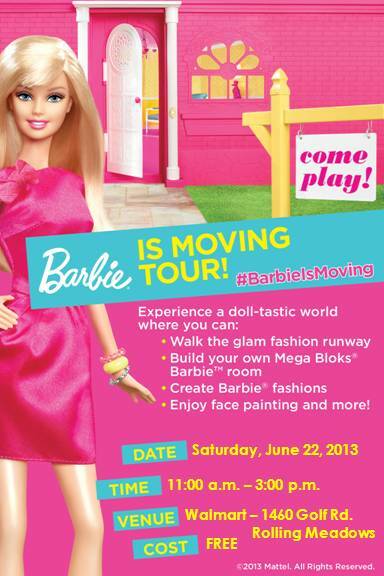 Disclosure: This post was sponsored by One2One Network to promote the #BarbieIsMoving campaign & events. My opinions are completely based on my own experience.